Moritz Meyer was born on 16 October 1873 in Vörden, in the Bersenbrück district. His wife, Toni Schönenberg, was born on July 1879 in Gelsenkirchen. They moved on 24 June 1900 from Dortmund to Gelsenkirchen. They lived at 158 Bismarck Strasse. 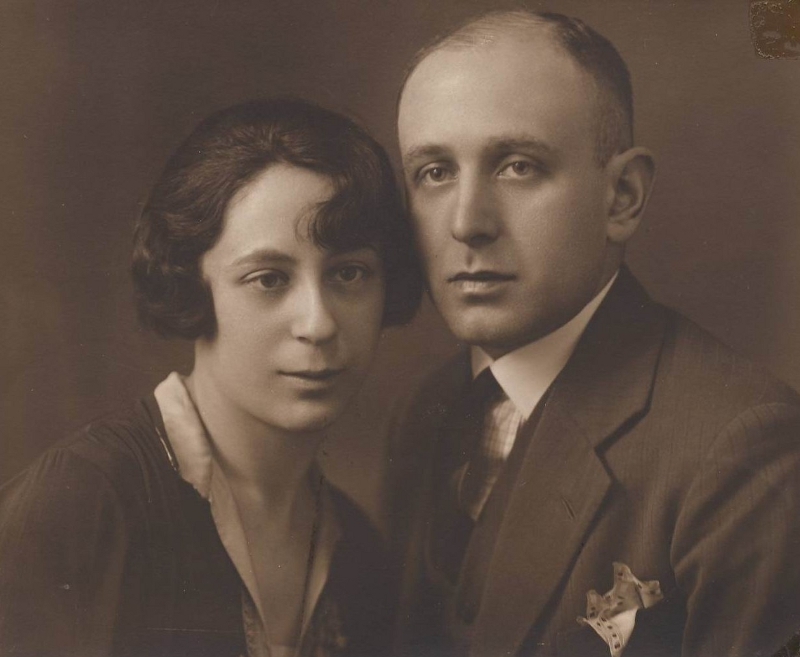 The couple had three children: Hans, born on 21 Juli 1901 and Paul, born on 30 April 1910. One child was born on 28 March 1907, but died the next day. 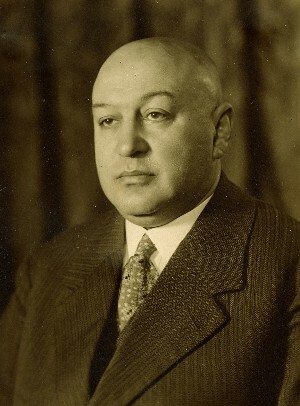 Moritz Meyer was a well known and respected businessman. He was a referee in a soccer club in which his son Paul also played. Moritz Meyer was actively involved in community work. His name is also found on the electoral list of 16 November 1930 establishing the liberal Jewish synagogue community in Gelsenkirchen. Toni Meyer’s mother, the widow Emilie Schönenberg, nee Spiegel, was born on 7. February 1851 near Soest, and died on 7 November 1934 Upon her death, the property and house at 156-158 Bismarck Strasse and a plot on Sellmannshof went to her heirs. Moritz Meyer managed the property for the heirs. He obtained approvals for the former industrial spaces in the house at 156 Bismarck Strasse to be converted to residential use. 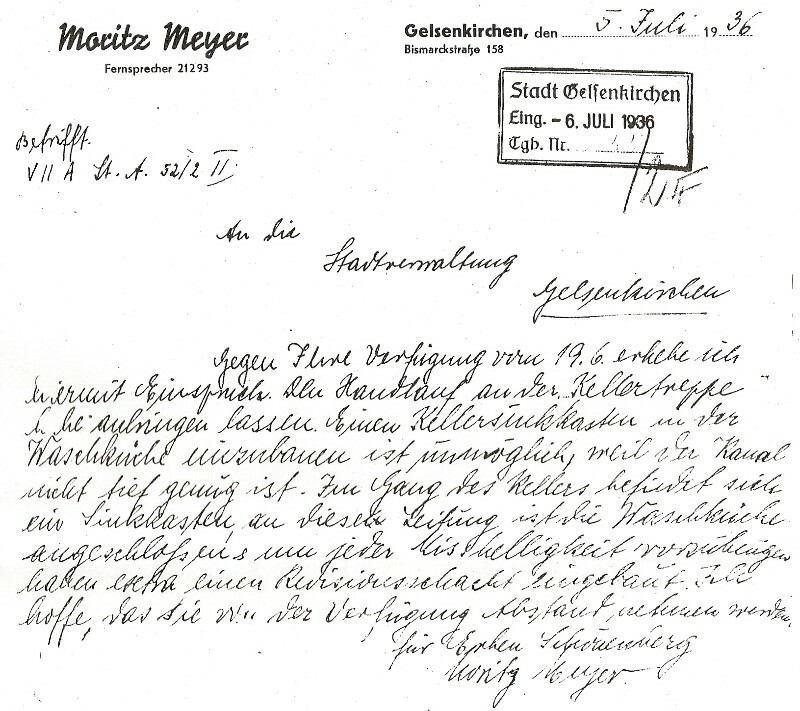 Conditions imposed by the Building Authority hampered his efforts so Moritz Meyer brought a complaint. 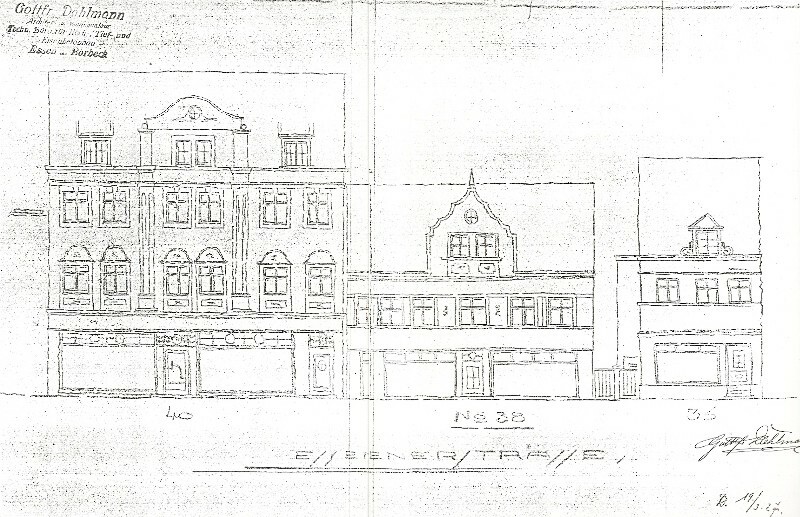 Businessman Moritz Meyer was listed in the 1934 adress book for Gelsenkirchen as the owner of the building on Essener Strasse 38. It also listed the Horst-Emscher Soccer Club at that address. The building housed Mortiz Meyer’s clothing and haberdashery business known throughout the city as "Meyer". Inquiry of Gertrude Oberreuter to the city building authority dated 26 February 1938. 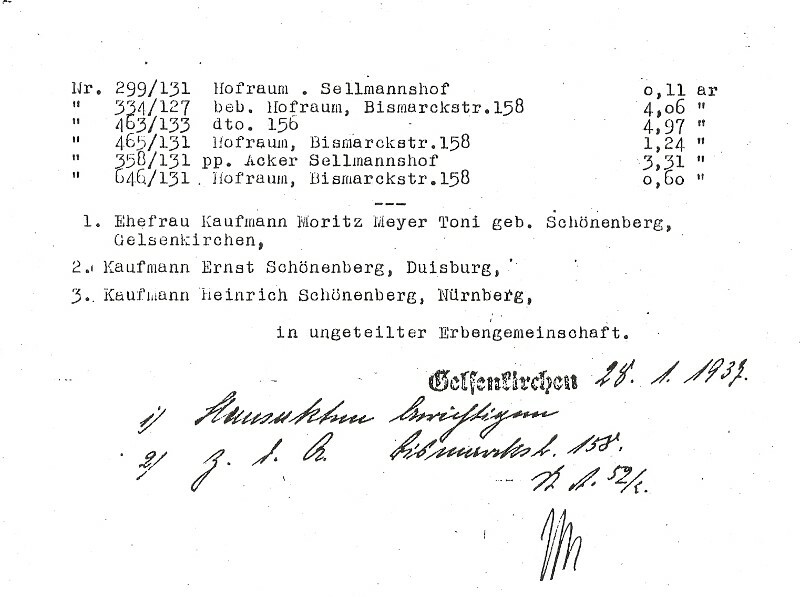 In the letter, she states that house Essen Strasse 38 in Gelsenkirchen, Germany, with a business formerly run by Moritz Meyer, was taken on 15 October 1937, and is now leased. The Meyer family witnessed the ever increasing discrimination in everyday life in Nazi Germany in all its inhuman harshness. On so-called "Kristallnacht" (the night of 9 to 10 November 1938, 'Night of broken Glass'), Moritz and his sons Hans and Paul were arrested and detained by the Nazis. 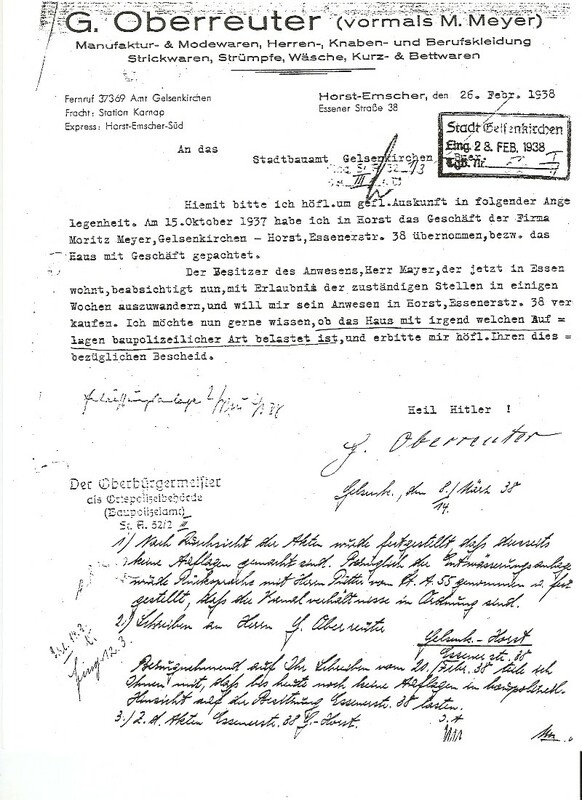 SS-Officials whom Moritz personally knew warned him: "Moritz, your life and that of your family is in danger if you stay in Germany. Sell your possessions and leave the country." Finally, Moritz Meyer was forced by the Nazis to sell all of his possessions and emigrate with the entire family. Meyer family fled to the Netherlands on 20 March 1939. They lived at 61 Eemstraat, Amsterdam. 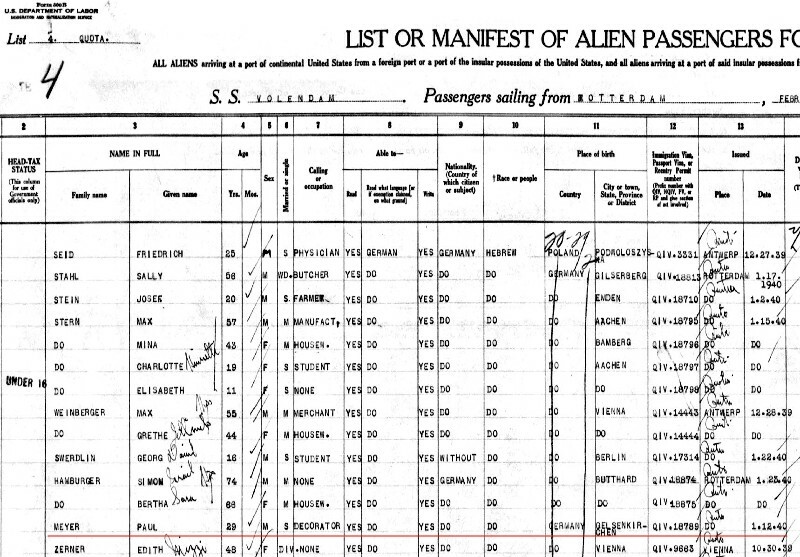 Paul succeeded in 1940 to immigrate to the United States. 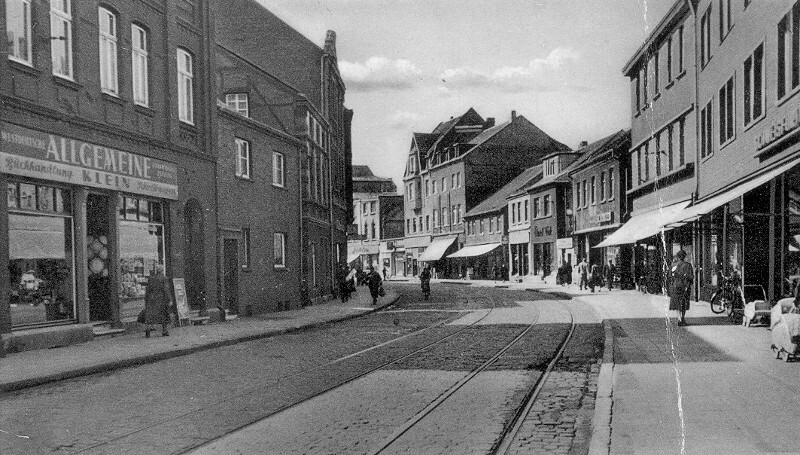 Hans was living at the time with his daughter Helga Johanna, and his wife Marta Rosa in their home town of Saarlouis. 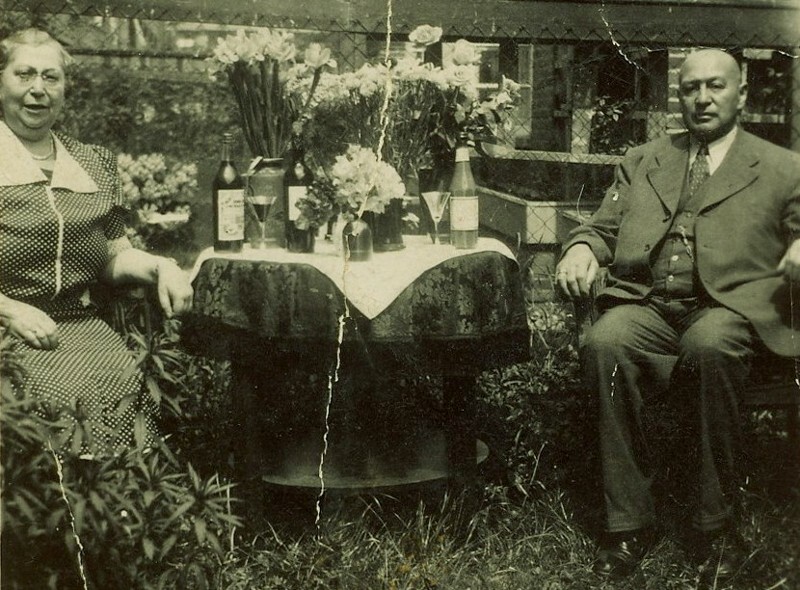 The couple married December 22, 1927. Witness of marriage: Moritz Meyer. 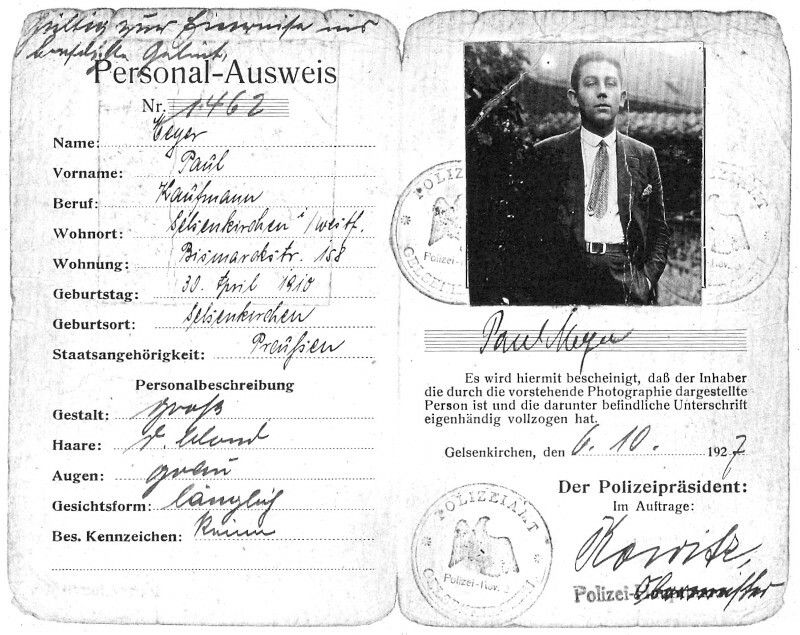 Hans also left with his family and emigrated February 18th, 1936 from Germany to the Netherlands. They lived 14 Hoendiepstraat in Amsterdam. In the summer of 1942, the deportation of the Jews began in the Netherlands. Hans, Marta Rosa and Helga Johanna were deported to Kamp Westerbork and then to the Auschwitz concentration camp where they were murdered in the gas chamber, Marta Rosa and Helga Johanna on October 29, 1942, Hans on February 28, 1943. 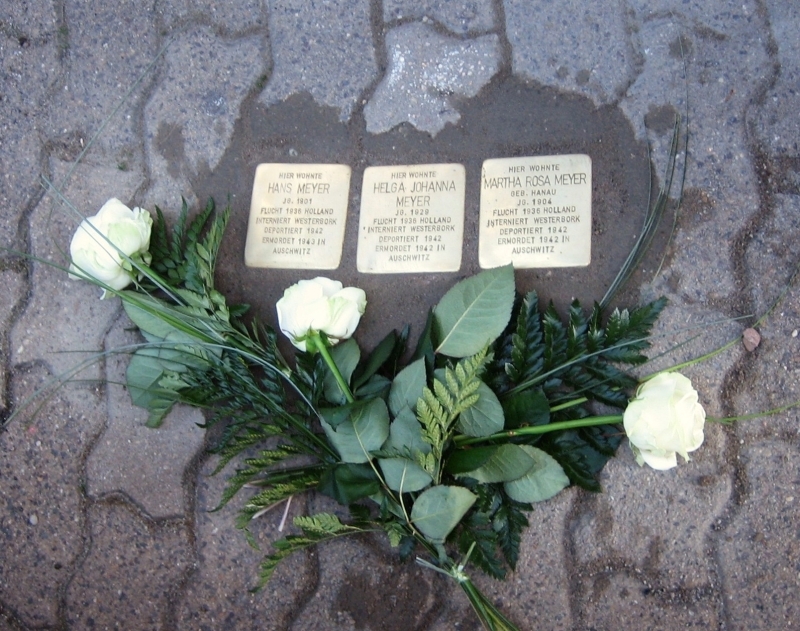 On April 8th, 2011 three so called Stolpersteine for remembrance where laid at Professor-Notton-Strasse 13 (before Neystrasse 2) in Saarlouis, Germany. At this adress Hans, Marta Rosa and Helga Johanna lived before they fled to the Netherlands. Moritz and Toni were deported to the Kamp Westerbork transit camp on January 20, 1943 and then sent on February 2, 1943 to the Auschwitz concentration camp and murdered there on February 5, 1943 in the gas chamber. Survivors reported that during Toni Meyer’s deportation from Westerbork to Auschwitz, she was so weak that she had to be carried on a stretcher, even into the gas chamber at Auschwitz. "The only child of Paul Meyer is Mark A. Meyer. He writes to us, "My father spoke very little of his childhood or about his parents; the memories were too painful for him. 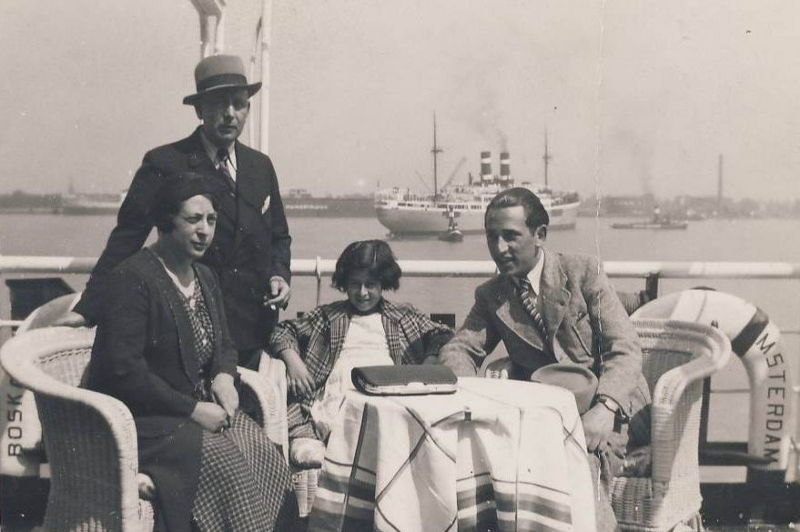 My father emigrated in February 1940 from the Netherlands (Rotterdam) on the "Volendam" to the U.S.
On the voyage, he met Ottilie Rimpel from Stuttgart. Paul and Ottilie married on 16 November 1940 in New York. I was born on 19 Dezember 1946. An uncle of my father was the owner of a large mail order business, Spiegel Brothers, in Chicago. They offered my father a job in 1940. My mother wanted to remain in New York, so my father stayed and worked as a pest controller in a pickle canning factory in New York." "My father enlisted in the US Army a few days after the American declaration of war on 7 December 1941. He took part in the landings in Italy in 1943 and at the Battle of Monte Cassino. After the capitulation of the Germans, my father visited Gelsenkirchen. The city had been razed almost completely to the ground. 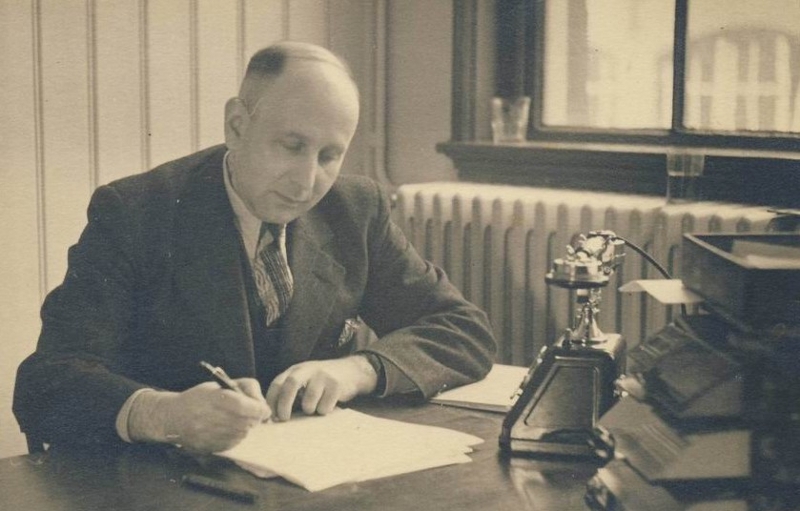 After the war, my father returned to New York and worked in various senior positions in the apparel industry. In 1972, he retired. My father died on July 6, 1981 suddenly and unexpectedly in his sleep. John H. Myers, my father's first cousin, who lived in Chicago, answered some questions about our family. John grew up in Bremen. My uncle Hans, my father's brother, was married to Marta Rosa Hanau. My aunt Marta Rosa was born on 24 März 1904 in Saarlouis. They had one daughter, Helga Johanna, who was born on 7 März 1929 in Saarlouis. Marta Rosa, Helga Johanna and Hans were deported on September 1942 from the Netherlands and on 29 October 1942 were murdered in Auschwitz. 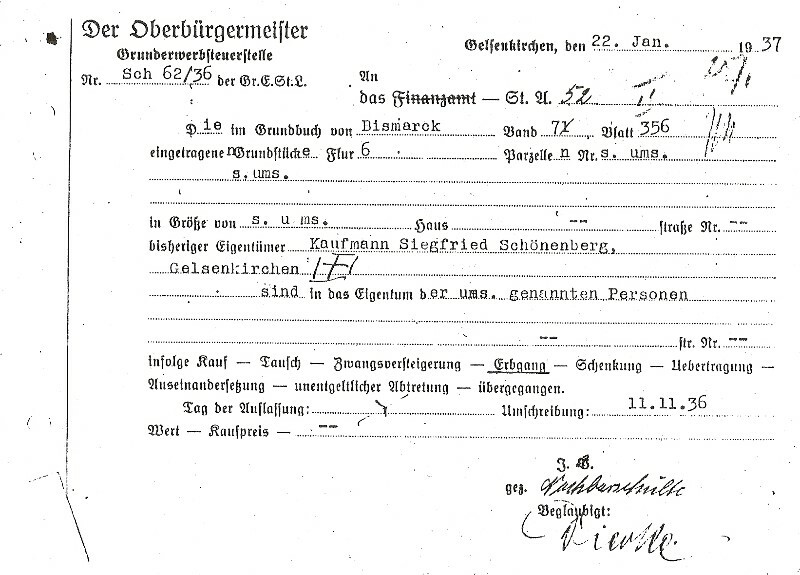 Based on information from John Myers, my grandparents were murdered in Auschwitz in 1943. John also told me that my father had many Jewish friends in Gelsenkirchen, some of whose names he knew, for example, Sigmund Halpern, Erich Buchheim, Hans Loewenberg and William Kaufmann. My father also had many non-Jewish friends, but unfortunately their names are not known to me. John remembered that my grandparents lived next door to a bakery. 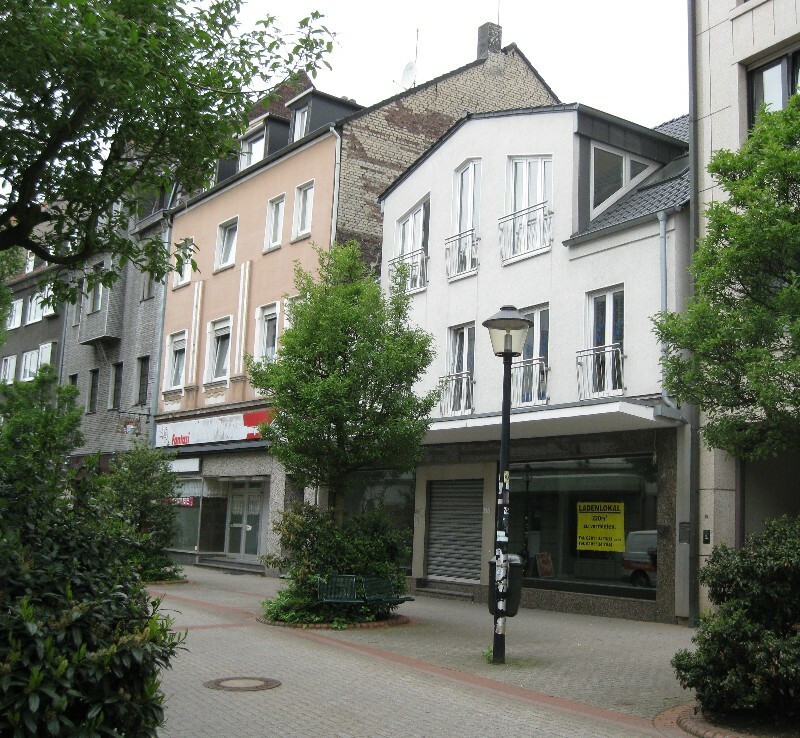 In the address book of the city of Gelsenkirchen, there is a bakery listed at 152 Bismarckstr. John told me that his father had once told him that his brother Moritz loved Gelsenkirchen so much he would only leave it for a distance where he could still see it. Moritz loved his home town of Gelsenkirchen very much. When I was in Gelsenkirchen in 1996, the then 86 year old Mrs. Huehn, a former neighbor of my grandparents, told me that she remembered the Meyer family very well. When they suddenly disappeared overnight in March 1939, Mrs. Huehn thought that they had just moved to another major city in Germany. She did not know that the Meyers had fled to Holland. 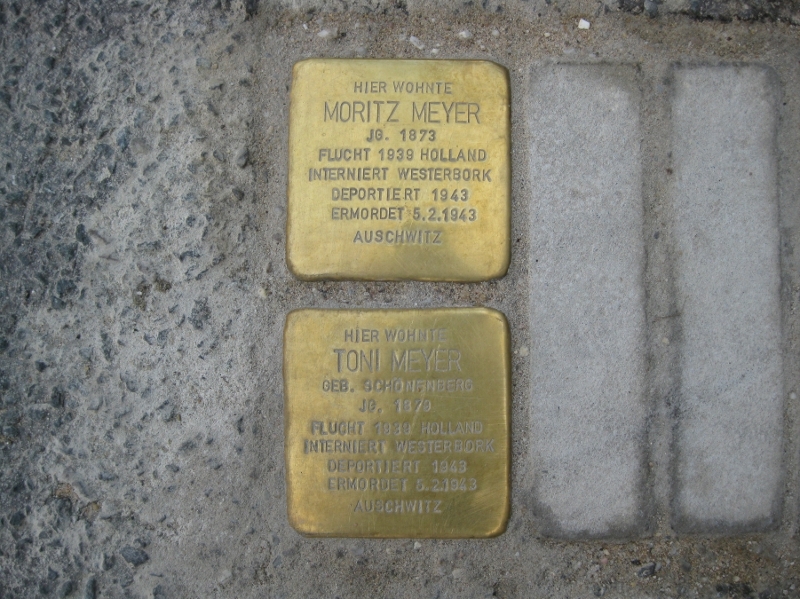 "Moritz and Toni Meyer were prominent citizens of Gelsenkirchen. They participated in community affairs and owned and operated the city’s best known haberdashery. 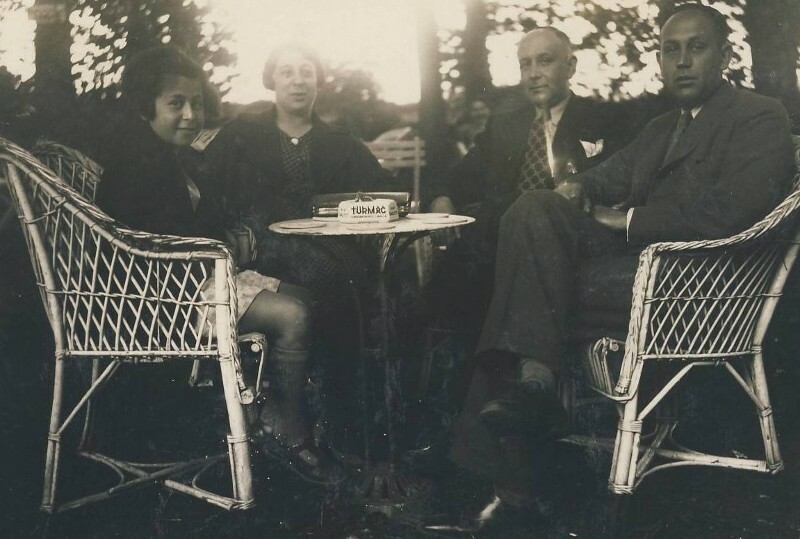 After Kristallnacht they were forced to flee their home and take up residence in Amsterdam. In 1942, they were carted off in a box car to Poland. Too sick to walk, Toni was carried naked by stretcher, along with Moritz, into the gas chamber at Auschwitz where the German state murdered them because they were Jewish. I am their only surviving grandchild. I never knew my grandparents. I never heard their voices, or felt their love, or had any of the great blessings that grandchildren receive from their grandparents. Moritz and Toni Meyer never had a gravesite to visit or a memorial at which I could pay my respects. To me, they were just images on a photograph and names on lists of murdered Jews – until now. The diminutive stolpersteine that you now place in this street are the only markers that exist that proclaim in their silence that once two very fine and innocent people, who loved, lived and worked in this city, were slain in the name of the German people. 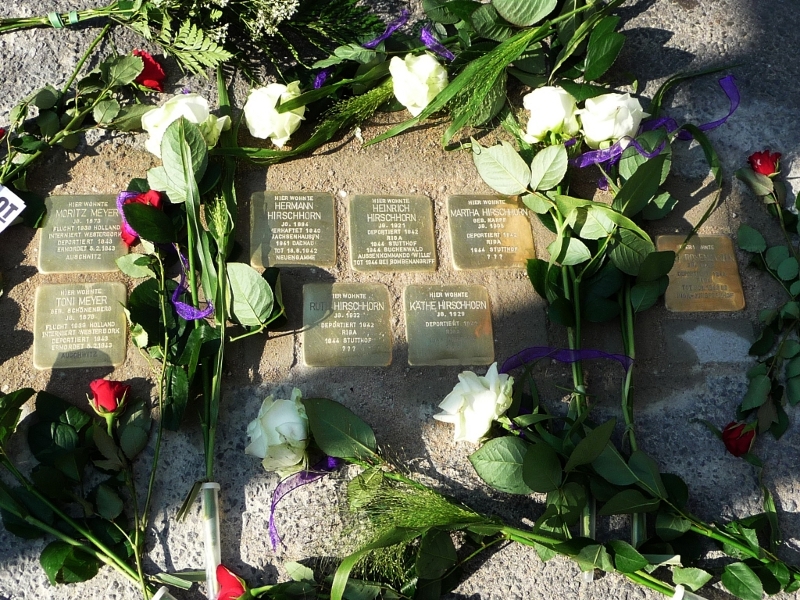 The stolpersteine represent much more than just the victims. They are a demonstration of the commitment of Germany to venerate the lives of the innocent citizens who fell victim to the Nazis regime and, most importantly, to prevent the recurrence of evil by remembering the gross iniquities and overwhelming horror of the Holocaust. Thank you for this and for remembering my grandparents." Moritz and Toni Meyer’s sole surviving descendent is Mark A. Meyer, the son of Paul and Otillie Meyer. Mark Meyer is an international lawyer who practices in New York City. He graduated from Harvard Law School and is an Adjunct Professor of Law at St. John’s University School of Law. He has been a special advisor for legal and economic matters to six European heads of state including the Presidents of Romania, the Republic of Moldova and the Republic of Montenegro. In 2004, the President of Romania decorated Mr. Meyer with Romania’s National Order of Merit in the Rank of Commander. In 2006, the President of the Republic of Moldova bestowed upon Mr. Meyer the Republic of Moldova’s highest civilian decoration, the Medal of Civic Merit. In 2007, St. John’s University School of Law conferred upon Mr. Meyer the degree of Doctor of Laws, honoris causa, describing him as "a pioneer in promoting the rule of law in Central and Eastern Europe since 1990." In 2004, Mr. Meyer was named a Harvard Law School Traphagen Distinguished Alumnus for his "great skill in the economic, legal and political transformation of a developing region".